We start with a thorough evaluation and proper measurements. We contact your insurance company with the scope of the restoration project. Move items off-site if necessary. Wipe down all surfaces and contents with special chemicals and other materials. Treat air and contents with ozone treatment. Perform a cleaning on air ducts, flooring and furniture. Seal and paint walls and ceilings if necessary. Move all furniture and contents back in property. Fire Damage Restoration is a very tedious procedure, and if not done properly residue and odor can be left behind. 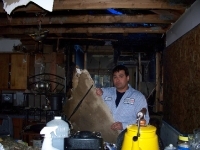 We recommend you use us as a certified fire damage restoration company for this. Most companies who handle this would be considered to be water and fire damage restoration companies. 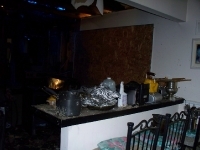 Fire smoke damage can be a scary experience. Call us and allow us to relieve much of thestress off you. 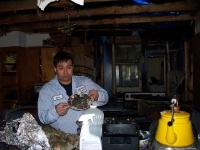 Whether it is a grease fire, smoke damage, soot damage, puff back, or any other kind of fire or smoke damage clean up, we use the proper techniques and skills to remove all the smoke damage, and repair all the fire damage for you properly and in a timely manner. We do all the re-construction as well so there is no need to contact another company. We can handle it all. Did you know that Capital Restoration is the best solution for your water, flood, or sewage emergency? IMMEDIATE response! At your door within an hour. 1 year guarantee on ALL work. 10% Discount applied to deductible or self pay. Fire Water Restoration And Clean Up From The Professionals At CAPITAL RESTORATION TEAM. The professional fire and water restoration experts at Capital Restoration Team have the tools and equipment to safely restore your property and belongings from the ravaging effects of fire. Restoring your property and belongings damaged by fire isn’t as simple as it may seem. Not only is there the devastation that comes with fire, extensive fire damage is often left behind. Our services detect and neutralize hazardous chemicals and odors to make your home as safe as possible following a fire. Fast, professional service at your door. Emergency fire and water restoration. Fast restoration of fire damaged and water damaged property. Professional, I.I.C.R.C. certified, licensed, bonded and insured providers. Smoke removal, soot removal and fire damage clean up. We use only high-tech, specialty equipment. Fire and smoke restoration is a complex and difficult process. There are health concerns, such as toxic gases, that are released when construction materials, solvents and glues are burned in a fire. These gases are toxic, and breathing them can have long-term, negative effects on your health. Restoring fire damaged property isn’t a job that amateurs can do; it’s best left up to the professionals at Capital Restoration Team.. Our technicians provide fire restoration services that remove soot, ash and smoke. Our providers will help you sort through the process of what needs to be restored and what needs to be thrown away. 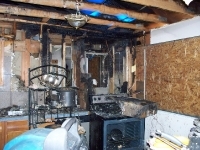 When fire damage strikes, call the providers at Water Damage Local.com. Our fire and water restoration experts will handle everything, from restoring your fire damage and water damage property to filing fire damage and water damage restoration insurance claims.